Joliet Army Ammunition Plant (JOAAP Project Delivery Team 2008) was the site of explosives manufacturing during World War II and the Korean and Vietnam wars. The site consists of old waste burial areas with an unknown mass of COCs. After the plant was decommissioned in the late 1970s, the Army began characterization efforts. In 1978, U.S. Army Environmental Command published an overall Installation Assessment that identified 53 areas of concern (AOCs) for environmental impacts. Installation and Restoration Surveys, Preliminary Assessments, Phase II RIs, and FSs were prepared for each of the identified AOCs. Two areas within JOAAP were listed on the NPL and addressed under the CERCLA program: the Manufacturing (MFG) Area and Load-Assemble-Package (LAP) Area (in 1987 and 1989, respectively). A 1998 ROD redefined the previously 53 AOCs as soil and groundwater OUs. Responsible parties, stakeholders, and decision makers include the Army, USEPA Region 5 and the State of Illinois EPA (IEPA). The primary soil and groundwater contaminants are explosives, including munitions constituents (MCs) such as RDX, NT, DNT, and TNT. Other contaminants include VOCs, PCBs, metals and sulfate. The extent of contamination and the site hydrogeological setting make groundwater remediation complex. The site hydrogeology consists generally of low-permeability formations made up of a heterogeneous glacial till overburden and an underlying shallow limestone dolomite bedrock. The site has many contaminant sources; contaminant plumes cover 36 square miles (629 million gallons of contaminated groundwater). There are multiple contaminants with different chemical properties and many plumes are comingled. Contaminant plumes reached the deeper fractured limestone matrix, which has low transmissivity and yield properties that make contaminant extraction and treatment difficult. Shallow contaminant plumes are in lower permeability, heterogeneous glacial till soil units. Waste burial areas include a mix of inorganic and organic contaminants that require conflicting treatment methods. It is difficult to treat the mix of contaminants in soil or groundwater (either above or below grade) using a single treatment technology. The first ROD for JOAAP (1998) identified four groundwater OUs—one of which was specific to groundwater zones that required no further cleanup action. A human health and ecological risk assessment was performed on 40 groundwater COCs. State potable and industrial groundwater standards were used as site objectives. For compounds that did not have IEPA standards, risk-based concentrations (RBCs) were developed and used as site objectives. RBC calculations assumed that groundwater would be used by an industrial worker and corresponded to 1 x 10-6 incremental carcinogenic risk for carcinogens and 1.0 hazard index for noncarcinogens. Remedial goals for groundwater depend on the aquifer classification. Contamination present in glacial till is subject to Illinois Class II groundwater quality standards; contamination present in the Silurian Dolomite is subject to Illinois Class I groundwater quality standards. Thirteen COCs exceeded site objectives for groundwater. Groundwater management zones (GMZs) were established for areas where groundwater was contaminated. Three areas within the site exceeded Class I and Class II state standards for groundwater. Site hydrology and hydrogeology and potential exposure routes are described in Figure 34 and Figure 35. As determined through risk assessments, there are currently no human or ecological receptors of the contaminated groundwater at JOAAP because there is no pathway for exposure or contact. ICs (deed restrictions and GMZs) are in place to prevent a pathway from being created. Figure 34. Site boundaries on surface elevation map showing surface hydrology (adapted from USEPA 1998a). Figure 35. CSM showing surface waters, elevations, and site geological cross-section (adapted from USEPA 1998a). Figure 36. 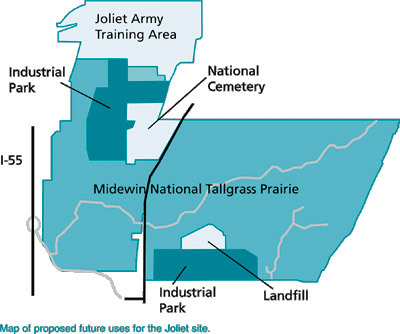 Map of proposed future uses for the Joliet site (adapted from USEPA 1998a). The final reuse plan enacted into law provided a clear framework for the remedy selection. The scope of groundwater remedy for both NPL sites consisted of MNA and the establishment of three GMZs to track required ICs until final cleanup levels are reached. Alternatives considered and reported in the 1998 ROD include no action, groundwater pumping, treatment using activated carbon, and removal of metals by precipitation. In addition to MNA, the Army also removed contaminated soils and surface waters that acted as a source to groundwater. Deeding and zoning restrictions, notifications to future JOAAP land owners, phytoremediation to enhance bioattenuation and periodic site inspections, and surface water monitoring were all elements of the limited action remedy. GMZs are required by Illinois regulations to identify areas that do not meet drinking water standards until cleanup activities are complete. GMZs delineate the areas where restrictions prohibiting groundwater use and uncontrolled soil excavation are necessary to prevent human contact with groundwater. 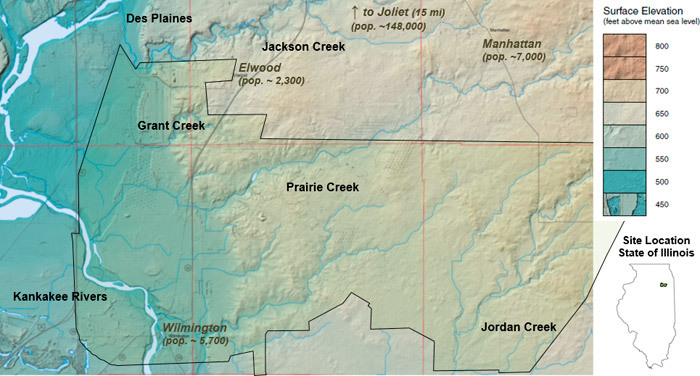 The GMZs comprised both the glacial drift and shallow bedrock aquifers. Monitoring wells were located to confirm that no groundwater exits the GMZ at concentrations above the remedial goals (RGs). A second area of wells will be placed at locations downgradient of the plume and between the plume and the GMZ boundary. The purpose of these wells will be to provide early warning for action to prevent groundwater with concentrations of contaminants above the RGs from reaching the compliance point. The third area of well placements will be around the perimeter of the GMZ. These wells will serve as compliance points and will be preferentially located downgradient of the plume. The purpose of these wells is to assure compliance with the conditional requirements of a GMZ. The GMZs were established with buffers to prevent groundwater wells from being installed within their borders. These restrictions are attached to land deeds and leasing agreements. Deed restrictions have been developed separately from the ROD by the Army, USEPA, IEPA and the future land users. The deed restrictions run with the land until there is agreement among the Army, USEPA, IEPA, and the current landowner to remove them. The deed restrictions were recorded with the local Will County Recorder (302 N. Chicago Street, Joliet, IL 60432). A Five-Year Review Report will provide an updated GMZ description, monitoring program implementation, and groundwater modeling. If the Army, USEPA, and IEPA determine that the limited action remedy timeframes are unacceptable, alternative remedial actions will be developed. For example, if groundwater plumes migrate beyond the boundaries of the established GMZs, or if groundwater is discharged to surface water at concentrations that exceed the water quality criteria established for JOAAP at the boundaries of the GMZs, or the natural attenuation process proves ineffective, then a contingency plan involving phytoremediation will be implemented. If phytoremediation proves ineffective, then a contingency plan involving a groundwater P&T system will be implemented. The 2004 Five-Year Review found that although the remedy was complying with requirements of the 1998 ROD, the GMZ required extension to prevent potential groundwater withdrawals from outside the GMZ borders. On the other hand, the number of sites was reduced because a site achieved remedial goals. Community involvement in remediation efforts was initiated with a Technical Review Committee (TRC) in 1988, after the Manufacturing Area was placed on the NPL. The TRC was replaced with a JOAAP Restoration Advisory Board (RAB) in December 1995. The RAB’s goal was to ensure that diverse interests within the local community were considered. The RAB facilitated public participation during the Proposed Plan and RODs for the soil cleanup, and played a critical oversight role and link to the community throughout the cleanup process, holding regular meetings from January 1996 through September 2007. In 1997, copies of Proposed Plans for the Soils OU and Groundwater OU were mailed to those who had expressed an interest. The Army held a public comment period. The RAB was briefed on the Proposed Plans and met again to discuss issues. Seventy-one sets of comments were received from the RAB, raising a total of 217 issues. The RAB met a third time to further discuss and vote on the proposals. Critical issues discussed included remediating the site quickly, using local or union labor in remedial actions, and improving the tax base. RAB concerns did not influence choice of remedial alternatives but were considered during remedy implementation. Some concerns brought up by the RAB relate to the selected MNA remedy. Public comments documented in the 1998 ROD included requests to detail contingency plans covering unacceptable performance (such as migration of contaminated groundwater beyond the GMZs, discharge of groundwater to surface water, causing water quality criteria to be exceeded). In response, contingency plans were incorporated into the ROD. The Army noted in one response that the likely timeframe for determining the effectiveness of MNA is 10 to 15 years. Based on a biomonitoring request, a site-specific JOAAP Biological Technical Assistance Group (BTAG) was formed to establish exposure levels for ecological resources that were protective of the environment and compatible with development of the tallgrass prairie. The Army, USEPA, and IEPA will consider the advice of the BTAG as they evaluate the need for a biomonitoring plan and for further study of MNA. Deed restrictions and monitoring also raised concerns among commenters. At that time, deed restrictions were being negotiated between the Army and future landowners, USEPA, and IEPA. In 2008, JOAAP soil cleanup activities were completed, three years ahead of schedule. Nearly all the land has been transferred and is being redeveloped in ways that are already accruing large-scale economic and ecosystem restoration benefits for the community and the region. ICs are still in place; long-term management and remedy O&M continue. The cleanup and redevelopment of JOAAP is a good example of how federal, state, and local governments can work effectively over time with communities, nongovernmental organizations, and the private sector to develop win-win solutions to a difficult problem. JOAAP’s hydrogeological setting makes the implementation of traditional remediation difficult and costly. Therefore, JOAAP’s groundwater contamination was addressed through the establishment of GMZs, deed and excavation restrictions, monitoring, and modeling. Resourceful methods allowed for land reuse while protecting human health and the environment. Groundwater plumes have remained within JOAAP property lines, allowing monitoring points of compliance to be established for each plume to demonstrate that no further migration is occurring. The GMZ designation will be in place until cleanup activities are complete.